This July Christopher Maltman will sing the title role in Harrison Birtwistle’s fascinating and highly acclaimed opera Gawain at Salzburg Festival. Mezzo Jennifer Johnston and baritone Ivan Ludlow make their opera debuts at Salzburg Festival singing the roles of Lady de Hautdesert and Agravine respectively. Based on a medieval epic associated with the Arthurian legends, it offers a vast arsenal of elements; magical powers and gloomy castles create the perfect backdrop for Birtwistle’s intriguing score. This new production at the Salzburg Festival is the first outside the Royal Opera House, where the piece premièred in 1991. 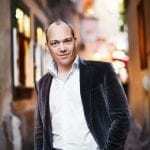 Fast becoming an established presence at the Salzburg Festival, Christopher Maltman has appeared twice as Don Giovanni in 2008 and 2010, and in 2011 as Guglielmo in Cosi fan tutte. Appearances during the 2012/13 season included Don Giovanni at the Berlin State Opera with Barenboim, Count Almaviva in Los Angeles with Dudamel, Posa in Frankfurt and Papageno at Covent Garden. His future plans include further appearances at Covent Garden, the Bavarian and Vienna State Opera and the Metropolitan Opera. This is Jennifer Johnston’s opera debut at the Salzburg Festival. Her engagements in 2012-3 season have included Götterdämmerung at the Bayerische Staatsoper and at the Munich Festival; Oedipus Rex with the LSO for Sir John Eliot Gardiner’s 70th Birthday in London and Paris, her debut at New York’s Carnegie Hall of Beethoven’s Missa Solemnis and Symphony No 9 with Sir John Eliot Gardiner as part of a major tour of the US and Europe. She will also appear twice at the BBC Proms: in Beethoven 9 with Petrenko and the NYO, and will give the world premiere of Anthony Payne’s arrangement of Vaughan Williams Four Last Songs with Osmo Vanska and the BBC Symphony Orchestra. This will be Ivan Ludlow’s debut for the Salzburg Festival. Ivan’s 2012/13 season has also included Britten’s War Requiem for both the Auckland Philharmonia and Seattle Symphony orchestras, Lulu for La Monnaie, Brussels and concerts of Puccini and Mahler in Duisburg, with Giordano Bellincampi. Ivan will repeat the role of Agravain in concert with the BBC Symphony Orchestra, and his performances next season also include a return to the Lyon Opera for Curlew River, to La Monnaie for both Jenufa and Sinbad, and a concert of music by Webern and Bartok at the Lucerne Festival, conducted by Pierre Boulez. Click here to find out more about the production at Salzburg Festival. Christopher Maltman has been writing a blog for the Salzburg Festival, read part 1 here and part 2.